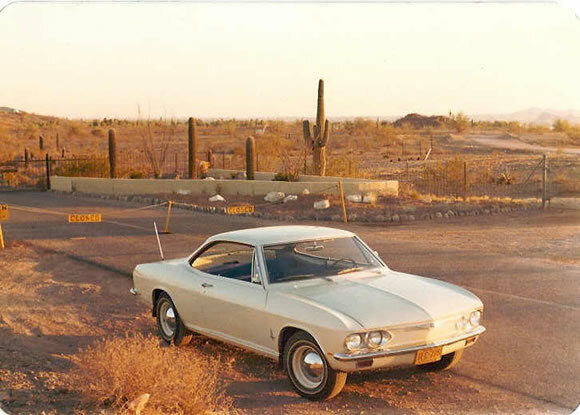 The Corvair is a cool looking car and with its Flat Six a very interesting part of Chevrolet history. Lots of American's seem to have had them as first cars and wish they had kept them. As one of the first 'Compact Cars' the Corvair heralded a new style. The car was very radical for Chevrolet because the engine was rear mounted, it stopped and it handled. Journalists fell over themselves to drive it when it was released and it sold very well. One of the coolest versions was a turbocharged model introduced in 1962 that had 150HP. Great horsepower in a light vehicle. In 1965 Ralph Nader wrote a book called Unsafe at any Speed about the automotive industries reluctance to put money into safety features. It used the Corvair as a case study and that badly affected sales. So with that, the Mustang, and what seems to be a lack of interest at GM, a beautiful car was laid to rest. This is a great classic car, and it's not easy to find. I live in Florida, and I can't find any around. I did find one in Salt Lake City Utah for only $8,800.00. Wow. That's a great example. Thanks for adding the link. I owned a 63 Spyder (turbo) convertible and a 66 Monza coupe. Most people who are into these cars own at least two. Extremely fun driving cars. That's cool. Two of these would be a lot of fun.